During the work week, Mexico City is a humming machine. There are countless vendors on the streets selling everything from cell phone cases to candies to fresh-squeezed juices. The metro overflows with people coming and going in a hurry. Traffic is heavy, and the familiar noises of the gas and tamal trucks can be heard. But, on the weekends, Mexico City comes to a halt. The streets become deserted, and the whole city feels almost like a ghost town. Stores close and everything is quiet. Sometimes, they even shut down Reforma, one of the main avenues, for people to ride their bikes, and life just seems to stand still. 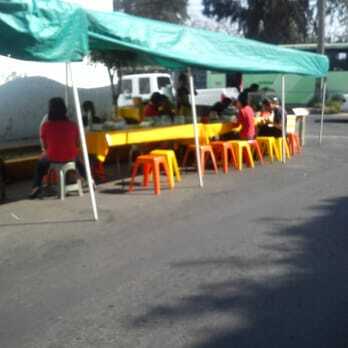 While there are very few vendors, it is on Sundays that the crowd-pleasing borrego stands make their appearance. I fondly remember getting up late on Sunday mornings and strolling down the quiet streets of our neighborhood with Roberto to the little borrego stand on the corner. We would pull up colorful plastic stools to the table that was covered in oilcloth and put in our order–two bowls of consomé de borrego (lamb soup) and four tacos, two “sin cilantro” (without cilantro) for Roberto and two “sin cebolla” (without onion) for me. 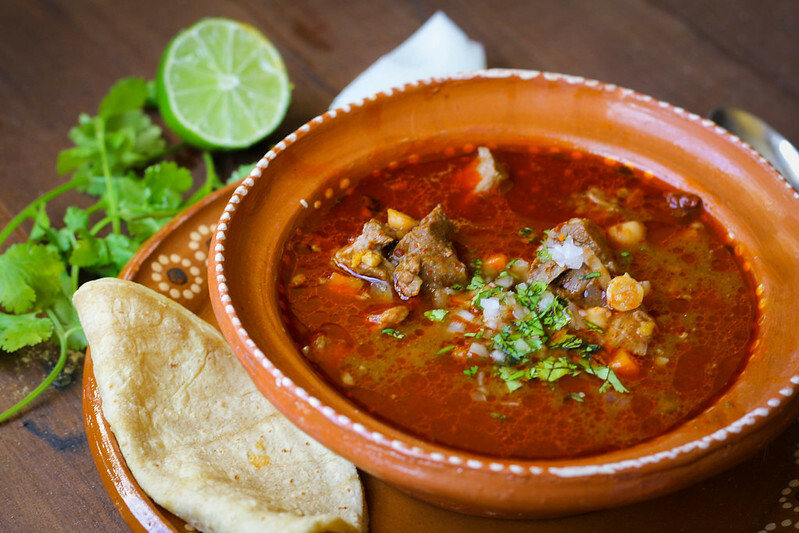 We would watch the señora ladle steaming helpfuls of the scarlet red soup into ceramic bowls and her husband, the taquero, chop up the lamb on the quintessential tree stump. He’d tuck the tender meat into the warm corn tortillas and place the tacos on the paper-lined plates. We would dress up our soup with cilantro, onion, and lime, and then sip down a spoonful. Ever since I was little, my dad has told me in Greek that some foods are “good for my insides,” and this is certainly one of them. It warms you up and seems to cure any illness. I love the addition of the chickpeas, and while I’m not a huge fan of raw onion, I love the bite of contrast that it provides as a garnish. 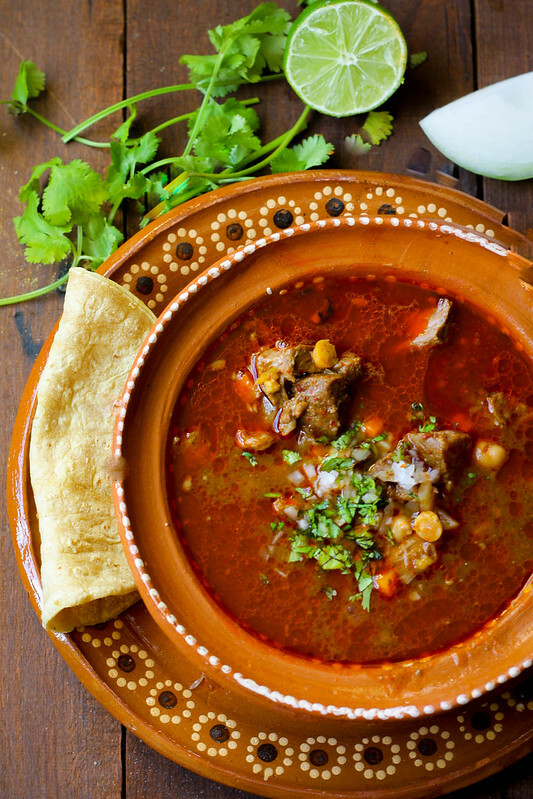 As a side note, traditional borrego (lamb) is slow-cooked in a pit overnight and is often prepared in the states surrounding Mexico City. It is usually only sold on Sundays because the vendors have to make the long drive into the city to sell it. So, it is quite a treat! Unfortunately, most of us don’t have access to a pit to slow-roast borrego, but with this recipe you can still enjoy all of the same flavors at home. 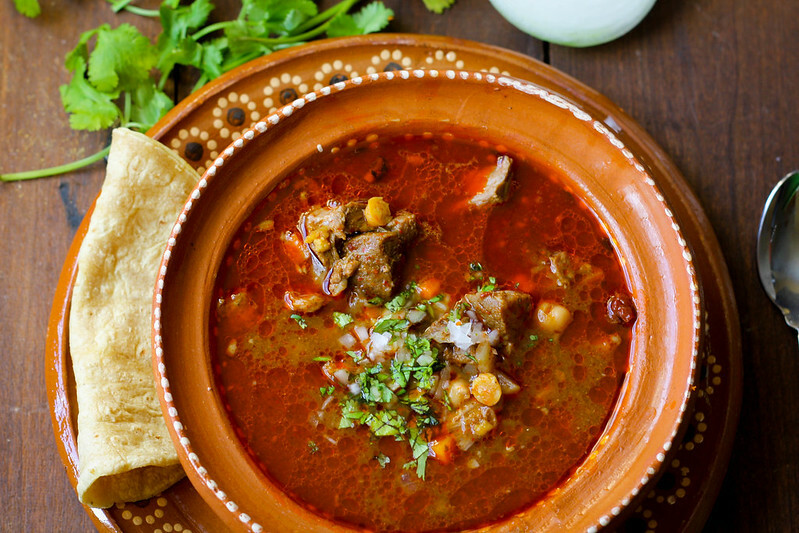 Consomé and tacos de borrego are the ultimate weekend food! They are great for a late brunch or even a hearty dinner. This recipe is perfect for one of those slow, cozy days that you plan to spend inside. →Cut the lamb into large chunks and place in stock pot (about 12 quarts). Add the lamb bone to the pot as well. Set aside. ~An additional 8+ cups of water (divided) will eventually be added to the pot at different times. →Place the toasted chiles, spices (marjoram, thyme, cumin, peppercorns, cloves, bay leaves, and avocado leaves), garlic, tomatoes, salt, and water in a blender. →Blend on high speed for 2-3 minutes or until completely smooth. You may need to add more water if the mixture is too thick. →Pour the chile mixture over the lamb. Add 2+ cups of water and cook the lamb over medium heat for 30 minutes. →After 30 minutes, add another 4 cups of water and cook for an additional 30 minutes or until the meat is soft. Then, add 2 more cups of water and cook for another 30 minutes. →At this point in time, add the vegetables, chipotles, and adobo sauce. Cook for an additional 20-30 minutes until the vegetables are soft. →Taste and add more salt if necessary. →To serve, pour yourself a bowl of soup. Squeeze some fresh lime juice in and top with cilantro and onion. Enjoy with some warm corn tortillas. I’m not crazy about the smell of lamb cooking, but I think the smell is slightly masked by the lovely smell of the chile mixture. Do not burn the chiles or they will become bitter. Marjoram is a fairly common spice. However, if you can’t find it, substitute oregano. Avocado leaves can be found at most Mexican grocery stores. If you can’t find them, you can substitute bay leaves. 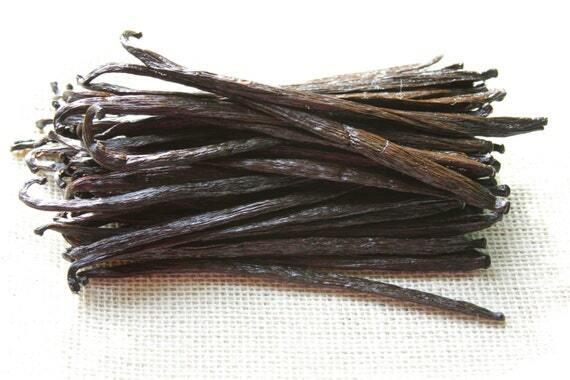 Our favorite brand of chipotles in adobo is San Marcos, but you can use any brand that you can find. The chipotles will break up when they are cooked. If you have leftover meat, you can make some killer tacos de borrego the next day.